Technology is revolutionizing medicine. New scanners enable doctors to “look into the patient’s body” and study their anatomy and physiology without the need of a scalpel. At an amazing speed new scanning technologies emerge, providing an ever growing and increasingly varied look into medical conditions. Today, we cannot “only” look at the bones within a body, but we can also examine soft tissue, blood flow, activation networks in the brain, and many more aspects of anatomy and physiology. The increased amount and complexity of the acquired medical imaging data leads to new challenges in knowledge extraction and decision making. In order to optimally exploit this new wealth of information, it is crucial that all this imaging data is successfully linked to the medical condition of the patient. In many cases, this is challenging, for example, when diagnosing early-stage cancer or mental disorders. Analogous to biomarkers, which are molecular structures that are used to identify medical conditions, imaging biomarkers are information structures in medical images that can help with diagnostics and treatment planning, formulated in terms of features that can be computed from the imaging data. Imaging biomarker discovery is a highly challenging task and traditionally only a single hypothesis (for a new biomarker) is examined at a time. This makes it impossible to explore a large number as well as more complex imaging biomarkers across multi-aspect data. 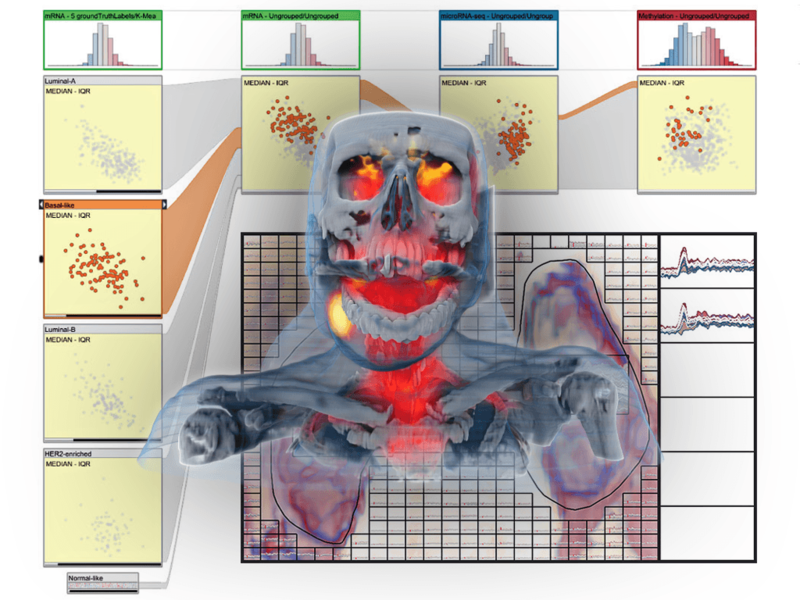 In the VIDI project, we propose to research and advance visual data science to improve imaging biomarker discovery through the visual integration of multi-aspect medical data with a new visualization-enabled hypothesis management framework. This project is funded by the Bergen Research Foundation (BFS) and the University of Bergen.